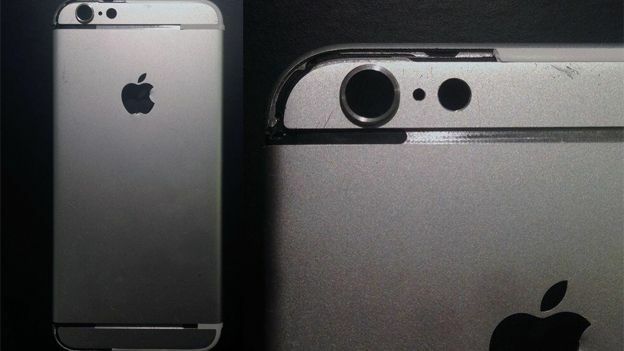 Fresh leaks, courtesy of grapevine incarnate Sonny Dickson, show off what looks to be the back-plate of an Apple iPhone 6. The first image shows off the phone in full view. The bands look pretty gritty, uneven, and likely unfinished. There's also a noticeably protruding camera, in line with what we've heard so far. The second image reveals a close-up of the camera section.The incomplete wrap-around bands mean this clearly isn't the final product. The camera also seems to protrude quite significantly, and is cased in what looks to be brushed aluminium. There's also an empty space where the Apple logo should be, which suggests that previous whispers of a light-up logo module could very well be true. There's not much else to glean from the new leaks, other than that we almost definitely know what the iPhone 6 looks like now. When you consider the sheer number of leaks we've seen so far, all with sporting the exact same design features, it's fair to say we're not expecting a surprise come the September reveal. We also saw what was purported to be the face-plate of an iPhone 6 earlier this week, with new images revealing a near-finished version of the display. Recent reports suggest Apple's upcoming smartphone is set for a 9th September announcement, the the actual on-sale date tipped for the 19th September. Tipsters also hinted last week that the fast-approaching handset would tout a 2.0GHz A8 CPU, a sapphire display, NFC technology, 802.11ac Wi-Fi support, and Cat 6 LTE, allowing download speeds of up to 300Mbps - assuming your provider will deal such nippy data out to you, of course. As always, you can check out our round-up of the all the Apple iPhone 6 rumours right here on T3.com.